The eyes have it, literally and metaphorically. From cover to cover, this issue displays the art of “seeing.” Separately, these stories and pictures depict all manner of storytelling, from the grotesque to the fanciful. Together, they blend to create a shrewd perspective of the complicated world in which we live, highlighting the virtuous and aberrant aspects of that world. My story is “Final Arrangements”. 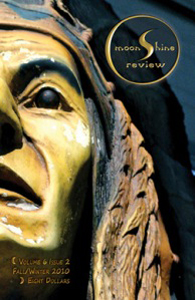 To purchase a copy of this issue of the moonShine review, click here.